Along with the beautiful, long, and sunny days of summer, come a few less than welcome guests: weeds. Taking care of them can be a daunting task. If you’ve ever tried pulling weeds out of planting beds or the lawn, you will know that they have decidedly earned their name. Removing them can feel like an exercise in futility. But don’t fret, there are ways you can successfully keep them at bay. We’ve collected a few useful tips for keeping your garden blooming and thriving with minimal stress. All gardens contain weed seeds, but only weeds in the top inch or two of soil get enough light to trigger germination and growth. Digging brings hidden weed seeds to the surface, so assume weed seeds are there ready to erupt every time you open a patch of ground. Dig only when you need to and immediately amend the disturbed spot with plants or mulch. In lawns, minimize soil disturbance by using a sharp knife with a narrow blade to slice through the roots of dandelions and other lawn weeds to stop their feed source rather than digging them out. Keep in mind that weed seeds can remain dormant for years. Mulch benefits plants by keeping the soil cool and moist and depriving weeds of light. We always recommend organic mulches, which you can find at your local nursery. Some light passes through chunky mulches, and often you may find that the mulch you used was laced with weed seeds. Replenish the mulch as needed to keep it about 2 inches deep (more than 3 inches deep can deprive soil of oxygen). Commit to a weeding schedule. This will keep maintenance manageable. There is an old saying “Pull when wet; hoe when dry”, which we think is wise advice with weeding. After a rain storm, equip yourself with gloves, a sitting pad, and a tarp for collecting the corpses. An old fork will also help because there’s nothing better for twisting out tendrils of weeds. When going after bigger weeds, use a fishtail weeder to pry up taprooted weeds, like dandelion. If weeding large areas, nothing beats a shuffle hoe. Make sure to keep the edges sharp. When you can’t remove weeds, the next best thing is to chop off their heads. With annual weeds, dead­heading buys you a few weeks of time before the weed “seed rain” begins. Use pruning loppers to take down tall weeds, or you can step up to a string trimmer equipped with a blade attachment to cut prickly thistles or brambles. No matter which method you choose, chopping down weeds before they go to seed will help keep them from spreading. If you have a steep slope with blackberry shrubs, do not tear them out! Blackberry shrubs have deep and strong root systems that do an excellent job of retaining slopes. Water the plants you want, not the weeds! Put drought on your side by depriving weeds of water. Placing drip irrigation beneath mulch efficiently irrigates plants while leaving nearby weeds thirsty. In most climates, depriving weeds of water reduces weed-seed germination by 50 to 70 percent. 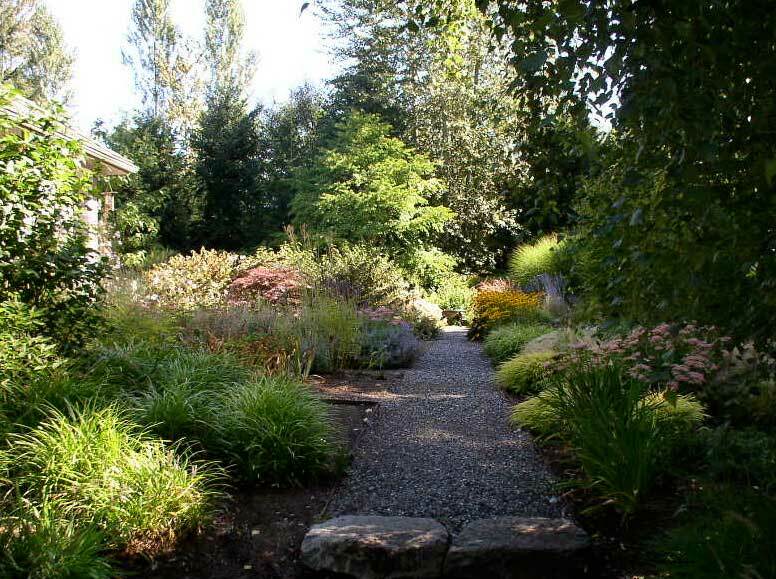 Enriching your soil with organic matter every chance you get can help your garden down the weed-free path.